NOTE: These are the redone graphics. Imagine EE with Darkness. A world where you can only see what the owner wants you to. This could add a whole new type of game play. • Lamp block (left) - The normal light block. It gives off light in all directions to a radius of about 8 blocks. • Hidden lamp block (right) - These special blocks are unlike any other. They are placed over regular blocks, decorations, or backgrounds. This is so that a builder can add light to normal blocks. In god mode a player can see the block transparent over where ever they are but in normal mode there are invisible allowing for the appearance of other blocks giving off light. they would cost energy and you would buy them in set amounts like doors or hazards. because they are put over all blocks and are invisible normally, they can not be stood on. that is to say players go through them with out any problem. thy radii can be custom set. Note: The quality is low. I know. Im sorry. • Crystal blocks - give off a glow equal to the players. Only needs to be bought once. • Search light block - gives of double the amount of light the lamp block does but only gives of light from the left and right sides. It can be rotated to give off light only up and down. Only needs to be bought once. • shine - lets you glow more than usual. • Show light in this world [on] - This is the regular setting in all worlds. no darkness at all. light blocks would appear to do nothing. • Show light in this world [off] - The world become dark in normal mode. You need light blocks to see. 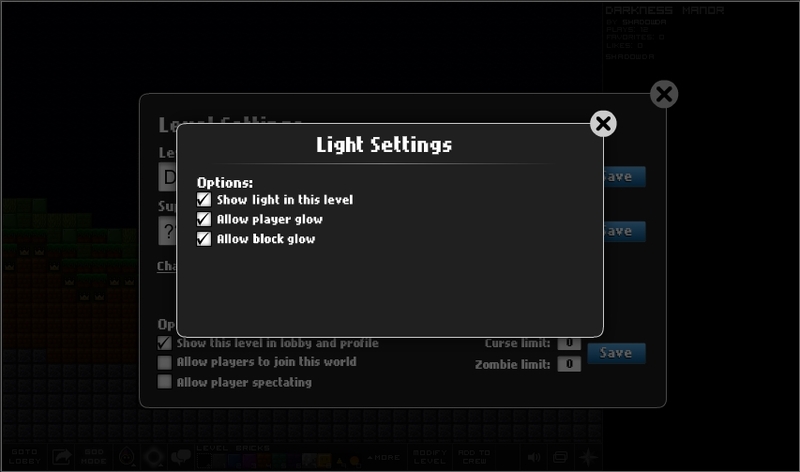 • Allow player glow [off] - players don't glow. • Allow block glow [off] - This is the regular setting in all worlds. When block glow is off some blocks that could glow do not. will glow with some level of light. Note: the hidden lamp block was invented so that player would not need to have a long list of blocks they could add light to via settings. light explained - a setting in worlds light or dark. 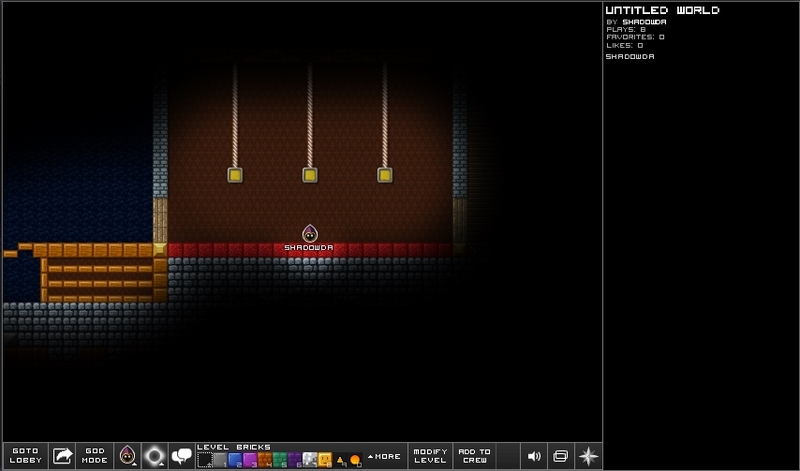 • dark - in non god mode the world is completely dark except for a few blocks around the player. light source blocks: such as lamps or my other ideas on a different post (the one at the bottom) lets you see. the first check box would dictate whether the world would dark or not. if checked the bar below would be used to set how dark the world is. if unchecked the world would be normal. all bright. 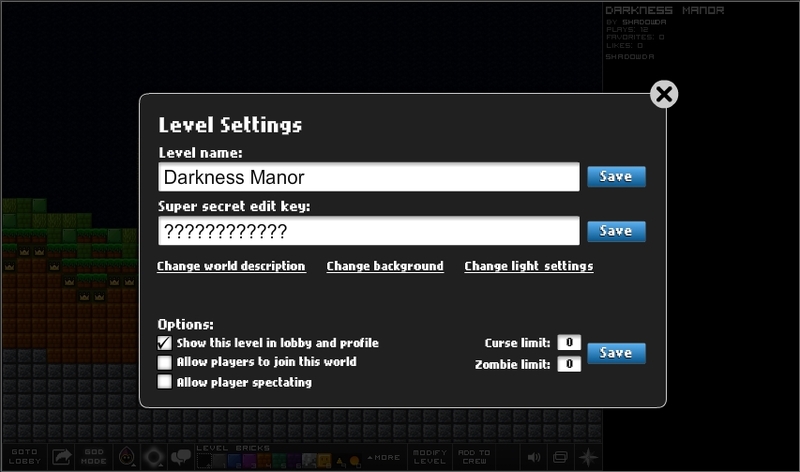 The second check box tells if a player glows. The block settings. when clicked. 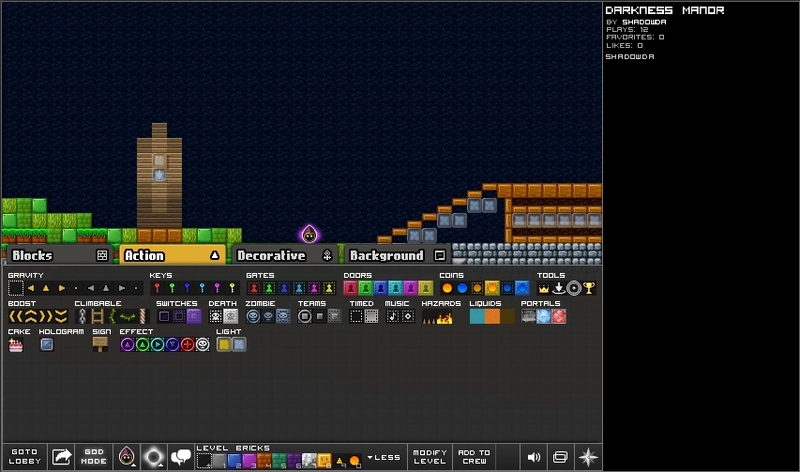 would open a new overlay (like the bg settings) with the ability to choose what normal blocks, blocks that are not specifically light blocks, have light. such as chose if signs, or gates have lights. uses block ids so any/every block even backgrounds can be set to glow to a set radius should you want to. 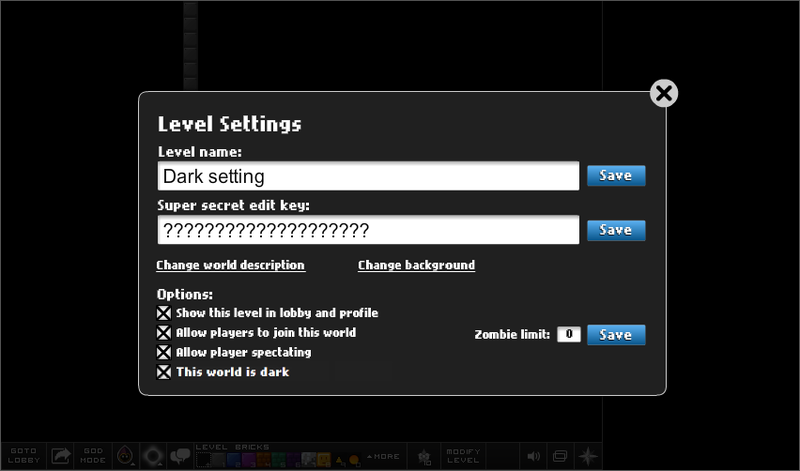 Don't forget to check out and reply to http://forums.everybodyedits.com/viewtopic.php?id=29687 the darkness suggestion. Good and bad at the same times, If I understand the actual concept of the lamp blocks, there's light only around the lamp block. It's clever, indeed, but i can already see people spamming those in the level and to be honest, it's kinda the same as secret blocks. Althought the Lamp block is a bad idea, the darkness is a really good one and can be used wisely to make awesome concepts! 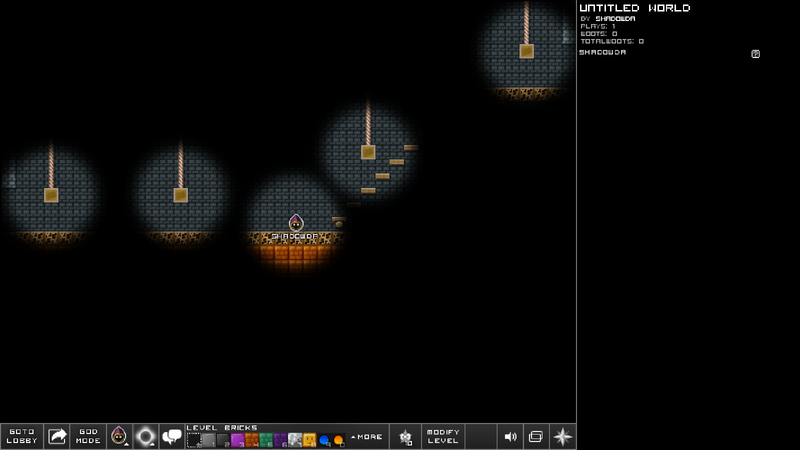 darkness is sort of like secret blocks. Except this acts as neither a background or a block and more like a front ground. 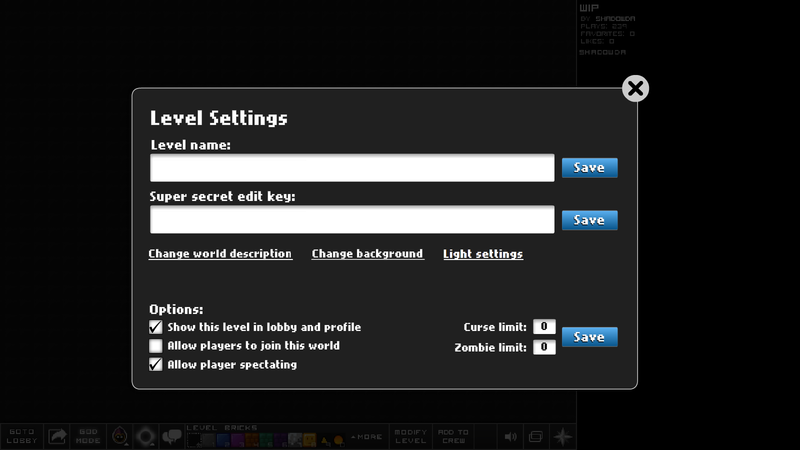 you can place secret blocks and when you touch them they "go away" but that limits you to only backgrounds. Darkness you cant place but rather is a setting. the idea is you cant see anything and you require lamp block or my other ideas for light blocks i.e. • the crystal blocks can give of a faint glow. The graphic for the lamp is meh but the concept and graphics (besides the lamp) is great! Im no graphics maker. 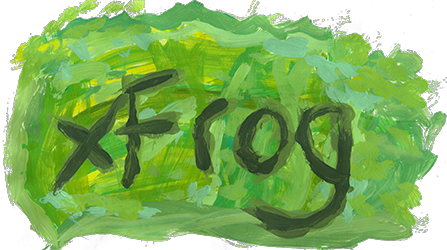 That's the power of paint.net and a guy who has no idea how to use it. If this were implemented, there should be a button thing to activate 'off' lamps if you step on it. You can just give some of the current items the ability to shine(giving that light circle). Let's say you want to use a background, that gives a certain radius of light. or a decoration(star). It should not always be a block or something physical. Then you could implement an item, that lets your smiley shine. of our own choice or just make the whole level dark. 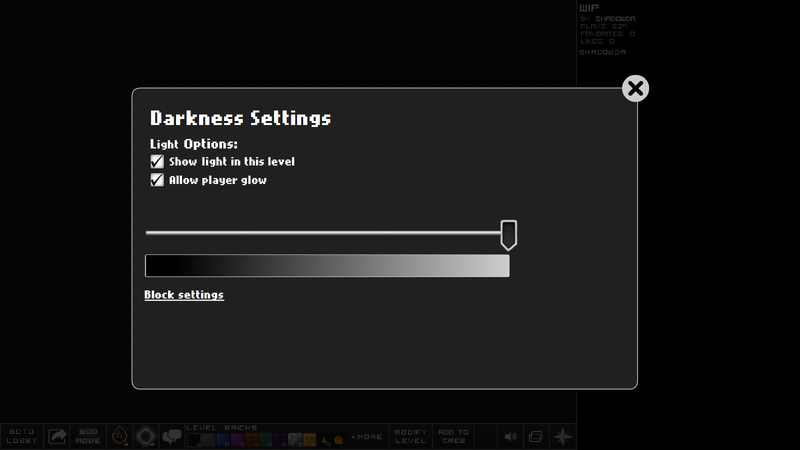 Also it would be nice to have different degrees/intensities of darkness for all the settings I wrote above. So it seems Block Miner rubbed off on somebody now, didn't it? Kids aside, I like darkness, and I like the lamp idea. I think if something like that were implemented, that would be tight af, especially for scary worlds. Now, we move onto the venture that is the minimap. How does it work in worlds like that? for starters. i never played block miner. as for minmap i would imagine it would either be as if the space was covered in actual dark blocks (the kind that makes you see through the minimap or it the space would be dark and become visible on map as you go thought the map, sort of like you adding to the map as you see it in game. Even though its still dark in game. Maybe because your graphic was horrible and nobody got what you mean't. Its a work in progress for the setting design. 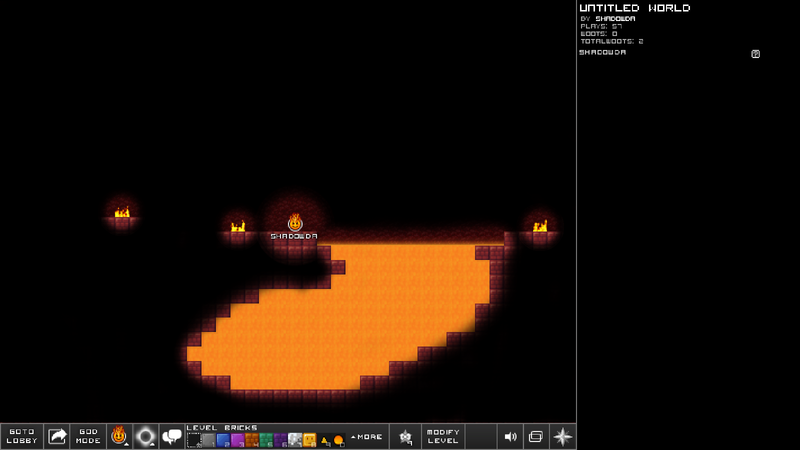 The lava (liquid) can have the same option of lamp. you know what. i tried this 3 times and i still haven't made it all dark. you can see where it should be dark, it is not . You could maybe make the night vision smiley see better in the dark and the flame smiley give off my light for obvious reasons. It's practically a fourth layer, on top of the other three (Hex background, background and blocks). Very similar to my Vision Blockers idea. Check it out here, you might like it as well. I saw your post, i saw it after i started this thread. I once thought of something like that but it was more in the sense of you could only edit inside the enclosed space. your idea is a very good one, and i hope your not upset about them being similar. I saw post, i saw it after i started this thread. I once thought of something like that but it was more in the sense of you could only edit inside the enclosed space. your idea is a very good one, and i hope your not upset about them being similar. Not at all. Because the ideas are similar, I'm hoping they would get enough support to eventually be added to the game, this way or another. night vision effect. good idea. i don't like the idea of smileys having powers. that opens a door to make strange changes. no smiley should have any more power than the other with darkness.